Natural stone thresholds not only serve to form a waterproof seal between the junction of two different flooring surfaces, they also provide a visually appealing decorative room accent. Marble and granite are two of the most commonly used materials for floor saddles, and the double Hollywood bevel style threshold is quite popular in commercial buildings, particularly hotels and resort communities. These transition saddles complement other natural stone used for flooring surfaces, window sills, bathroom walls and shower curbs. Once expensive to obtain, double Hollywood bevel thresholds are now available at wholesale prices from Stonexchange, a direct manufacturer and importer of the finest quality granite and marble flooring products. We oversee our own fabrication facilities and distribute our line of thresholds to commercial customers throughout the continental United States. Flooring product retailers, independent installation contractors, and home improvement centers can take advantage of our rock-bottom prices on the most popular styles and sizes of these expertly crafted transition saddles. The granite and marble flooring products seen in retail showrooms were originally huge slabs of natural stone taken from quarrying sites in another part of the world. Quarry operators extract these slabs, grade them according to their color, veining patterns, and texture, and send them to a cutting facility where they are thinned into sheets through the use of a cable saw or enormous diamond dust-tipped blade. The sheets are then cut down into strips and shaped into beautiful floor thresholds. To keep wholesale costs to a minimum, Stonexchange owns and operates its manufacturing center and fabrication facility. We pack large crates full of finished product and send them via container ship to our Miami-based distribution warehouse. Domestic customers can order full crate loads of thresholds at fantastically low prices. Double Hollywood bevel thresholds are often specified as the saddle type required to finish a flooring project in a hotel, condominium, office interior, or luxury resort complex. A large number of these thresholds are needed to complete the job. Contractors winning the project bid must be able to meet their own materials budget, and keeping the cost low on top-quality granite or marble products is critical. This is where Stonexchange comes in. Our company has an ongoing shipment schedule that ensures a full inventory of material is maintained at our Florida distribution center. Customers needing full crates of double Hollywood bevel thresholds can rely on us for immediate order processing and rapid delivery. Our overland freight company partners are always ready to deliver a full order to a flooring product retailer or directly to a job site. 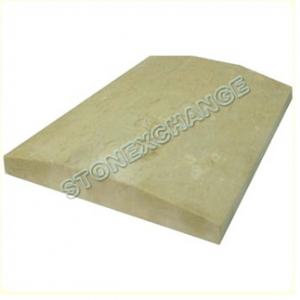 The type of stone used for thresholds depends on the desire of the interior designer or the wishes of the end-user. Some residential developments leave much of the final interior design up to the buyer, meaning that the actual materials used for the floor, bath area, and window sills is not known during the initial stages of construction. On the other hand, hotels usually will have a definite floor plan for each room or suite, and several different types of stone material will be used by the time the structure is completed or renovated. At Stonexchange, customers have the option of ordering granite or marble thresholds. Several different color shades are available, and custom sizing is also considered. We ship our products directly from our warehouse to any commercial customer destination in the U.S. Granite is one of the hardest known substances, and it is a preferred material for flooring tiles, countertops, window sills, and transition thresholds. Our double Hollywood bevel thresholds made from granite are a polished black stone with very little speckling. These saddles have a very lustrous shine and are perfect for use when the instructions call for the use of Galaxy or similar shade material. Our Absolute Black granite double Hollywood bevel thresholds are available in the standard 36-inch length and come in 4-inch and 6-inch widths. They are 5/8-inch in thickness and are packed in crates containing 50 pieces. The 4-inch width style has a narrow 1 1/4-inch wide flat top surface. Crema Sahara Marfil is a cream/beige marble. It is one of the most commonly requested threshold materials and works well with other neutral shades used in the immediate area where the threshold is placed. Orders specifying the use of Botticcino or Bursa marble can be filled using our Crema Marfil shade. Our Crema Sahara Marfil double Hollywood bevel thresholds are available in standard 36-inch lengths, come in widths of 4-inch, 4.5-inch, 5-inch, and 6-inch, and are 5/8-inch in thickness. 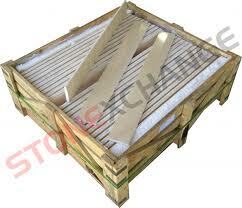 Our customers can obtain this material in full crates containing 100 pieces. Because of its popularity as a transition saddle material, Stonexchange keeps a very large inventory of this product on hand at all times. Our Nuevo White Carrara double Hollywood bevel thresholds are a bright white marble streaked with grey veins. This product is very popular with commercial customers who desire a stately, authentic look to a room interior. Orders specifying Alabama, Cherokee, Georgia, or Vermont White marble products will be filled using this shade. Stonexchange delivers Nuevo White Carrara double Hollywood bevel thresholds in standard 36-inch lengths and with a thickness of 5/8-inch. This product is available in 4-inch, 5-inch, and 6-inch widths, and is packed in crates containing 100 pieces. All of our granite and marble stone thresholds can also be purchased in non-standard widths and thicknesses. Pure White Thazoz is an engineered stone, a combination of resin and glass. These double Hollywood bevel thresholds are very bright in color, are finely polished, and have no vein patterns. Available in 4-inch width and a thickness of 5/8-inch, these saddles are packed and sold in crates containing 50 pieces. Double Hollywood bevel thresholds are generally used in commercial structures. New hotel construction as well as existing hotel renovation calls for the use of hundreds of threshold pieces, some of them standard length and some of them custom-cut to fit unusual doorway dimensions. Stonexchange is the best source for obtaining full crates of top-quality granite or marble transition saddles at wholesale prices. Standard orders are usually shipped within just a few days after the price quote is given. Non-standard sizes must be cut and shaped at our manufacturing plant. These orders may require a lead time of up to eight weeks. However, our company does not charge extra for these customized orders. Mixing and matching is also not a problem so long as the minimum piece count is ordered for each individual style of threshold. Our company partners with reputable overland shipping firms and can set up a very reliable repeat shipping service to retail flooring product merchants as well as large-scale contractors and construction companies. Our products are available year-round, even during the slower winter season. Our commercial customers save a tremendous amount of money by ordering full crate loads of granite and marble thresholds. The enormous weight of natural stone certainly contributes to its high cost, but customers who purchase in bulk enjoy the lowest wholesale cost in the industry. This is because Stonexchange is the manufacturer as well as the importer, with no middle-level sales in between. It its vitally important for flooring product retailers to keep a supply of stock on hand or at least have the ability to have it delivered to the customer in a matter of days. Last-minute changes to floor surface designs are not uncommon, and contractors often have difficulty obtaining a few pieces that match the new instructions. Merchants keeping the popular threshold styles on hand will retain a higher percentage of business from local independent installers and subcontractors. Whether an independent flooring product installer, home improvement chain, or local flooring tile, carpet, or hardwood product merchant, all who need the best quality natural stone material at the lowest wholesale prices will benefit from doing business with a direct importer of granite and marble. Stonexchange welcomes inquiries from those who would like information on becoming a dealer or seller of our double Hollywood bevel thresholds as well as our other natural stone materials. We offer what few other companies can, and that is the guaranteed lowest prices on the most popular styles and color shades of beautiful granite and marble. Check out our products online. Do not hesitate to contact us for details on how to order and to obtain an initial price quote. For those looking to sell our natural stone products directly to the public, give us a call and we will be happy to discuss delivery schedules and probable lead times for oversized orders. Stonexchange is the direct connection between manufacturer and commercial customer, and we offer our products with the very best customer guarantee in the industry.